Time seems to have gotten away from me the last couple of weeks. My work schedule has been horrendous! I have the past two weeks of my mobile podcasts not posted. So, I have decided to combine the previous episodes with this one. Therefore, this post will in fact cover two previously recorded podcasts, May 12 (#48) & 20th (#49), and todays, for the price of one. My post will contain a little of each of the two previous, what I can remember. So, if you get tired of listening, listen in chunks..one bite at the time. Just so you know, I ramble as usual. The boys were mentioned in the earlier podcasts. They had there dental cleaning. Dogs have to have anesthesia for deep dental cleaning. I have not seen them this calm in a long while, especially Jodi! Life is calm under the residual influence of anesthesia. Gizmo will have an additional follow up related to an abnormal lab result. He will be tested for "Cushing's" disease. Nothing life threatening if he has it, just medication. They both seem to be doing just fine. This now brings me to my current podcast! Finally, My 50th Episode and Memorial Day to boot!! This calls for a giveaway. There will be FABRIC involved and ruler (Kaleidoscope Smart Plate). The giveaway will run through Saturday, 31 May. I will draw on Sunday. This will give all who listen a chance to participate. 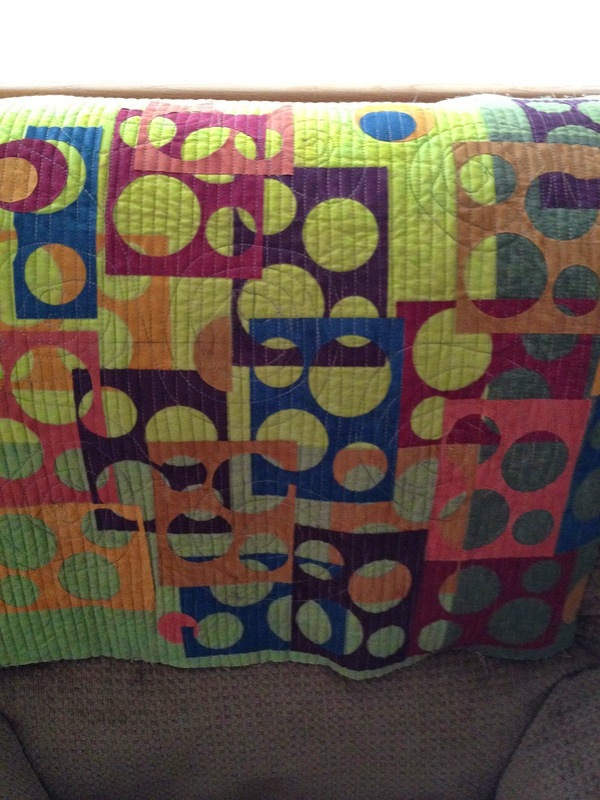 What you need to do is leave a comment on this post about your most challenging quilt and Tweet about the giveaway. Also, join in on the #MDSI! Hint: some of us started early. I continue to promote Daisy's UFO 2014 Challenge! Remember, she will be giving away one of her quilts! So, with that stated, come join in the fun. Another giveaway to be on the look out for is from Pam, HTBAS Podcast. She will host her giveaway once Daisy's is complete. My RR progress. I received my box from the person is assigned to mail to me on 15 May. The box sat it on my kitchen counter for about a week before I opened it. Once I did, it sat open on my longarm table a while. Once I looked through the box, my dilemma began. What do I do? Do I follow Daisy's guidelines and work on my own? Well today, I have completed my addition to the center square. It did take four design decisions before I decided. Next up on my list for completion is the summer PC swap! I have my design, just have to put it to fabric. Last week my DD and I went to see Divergent. I have loved listening to the first two books and have the third in my queue. The moving did well relating to the events in the book. It was very entertaining and have faces associated with names in the book seem to have made the movie more interesting to me! Other book excitement added to my listening queue is book 13 of the Women's Murder Club by James Patterson. I am a big fan of this series and have enjoyed every book. Can't wait to see what Lindsay Boxer gets into now. Summer TV watching! Under the Dome airs 30 June, I believe and Outlander airs on Starz sometime this summer. Can't wait for these two show begin. Tell me, is it possible to be enamoured by the name "Jaimie" and facinated by the words Kilts, Dirks, and Sassenach? I am currently listening to Book 4 of the Outlander series, "Drums of Autumn". Thanks to Pam of Hip To Be A Square podcast.